Happy Tuesday! Today, I have a card for you for the Paper Crafting World Challenge Reminder. The theme is Mother's Day. For my card, I used the Bear Mom and Baby digital stamp file. When I got to Target, they have a section where this company displays cards that were made. These cards are usually handmade and some are hybrid cards. I have been getting into hybrid cards lately. I have figured out how to make a digital card base using the Cameo, which makes the card look like you brought from the store. Once I had my card base cut out, I cut the Bear Mom and Baby digital stamp file using the Cameo. I cut the actual image and then I made a copy, performed an offset so I could have a shadow behind the image. I popped up the stamp with stampin' dimensionals. 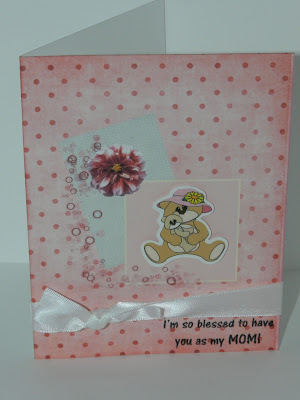 I used Cardz TV's Mother's Day stamp set for the sentiments. I cut a slit in the spine of the card to insert a place for my ribbon. Don't forget to head over to Cooking With Cricut to join use in the challenge. I would love to see what you create.